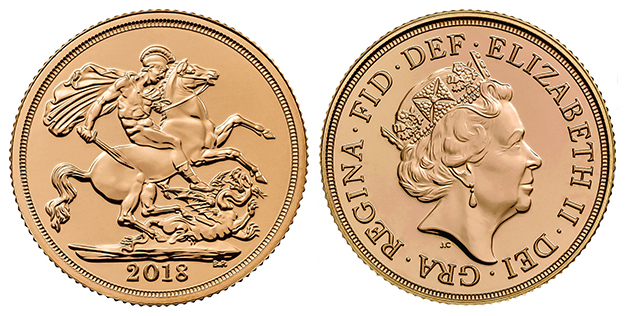 The gold Sovereign is one of the oldest British coins still in production by the Royal Mint. 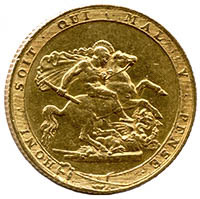 Traditionally the coin features the present monarch on the obverse (front) of the coin, and St George slaying a dragon on the reverse. 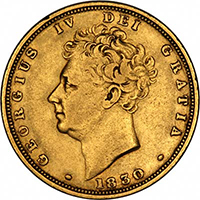 First struck in 1817 following the Great Recoinage of 1816, Sovereign coins were used in common circulation but are now only available in bullion or proof forms, depending on your interest as an investor, collector, or simply somebody looking for a gift. The gold Sovereign coins of today are the successors of the old English gold sovereigns, first introduced under King Henry VII in 1489. 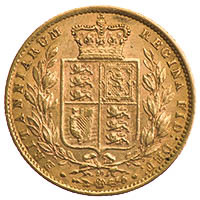 Later adaptations of the coin included the Crown Gold, Unites, Laurels, Broads, and eventually Guineas. Gold Sovereign coins weigh 7.98 grams, of which 7.3224 grams is fine gold. 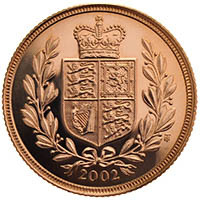 This puts the Sovereign at 22 carat purity, which is the gold purity the Royal Mint has always produced these coins at. The remaining metals are primarily copper, though others are used to help with the coin’s strength and resilience to damage. The current design of Sovereign is produced at 22.05mm in diameter and with a 1.52mm thickness, but these can fractionally vary depending on the age and condition of the Sovereign. There are several types of gold Sovereign based upon their size, including the quarter, half, double, and quintuple sizes. 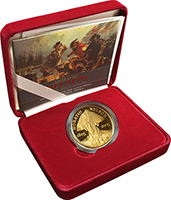 The smaller sizes are available in bullion and proof finishes, while the larger are proof-only editions. For specifications of these coins, click here. Italian sculptor and artist Benedetto Pistrucci came to London in 1816 to show off his artistic talents. He caught the eye of Lady Spencer, who commissioned him to reproduce a wax model of Saint George and the Dragon (as made by Nathaniel Marchant) but in Greek style, with Knight of the Garter regalia. Upon completion he was commissioned once again, this time by the Master of the Mint, to produce models for the new British coinage. Pistrucci completed the design and even engraved the dies himself due to the Mint’s engravers not being able to accurately replicate his work. Benedetto Pistrucci’s original design was a gold Sovereign with a thick border bearing the words ’HONI SOIT QUI MAL Y PENSE’, which is latin for “Evil unto him who thinks evil of it”. These words also feature on the royal coat of arms and the Order of the Garter. 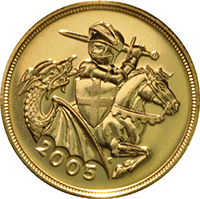 The gold sovereign design sees St George riding a horse and trampling a dragon, whilst wearing a plumed helmet, flowing cape, and wielding a broken spear. Four years later, Pistrucci’s design was altered. Gone was the latin and the thick border, allowing for a larger image of St George and in greater detail. The broken spear was replaced for a mythical sword, known as Ascalon. 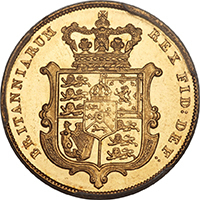 Commissioned in 1823, King George wanted a new set of coin designs. French engraver and medallist Jean Baptiste Merlen obliged, and the new shield Sovereign was born. King William came to the British throne in 1830. He commissioned the Paris Mint’s Jean Baptiste Merlen to update his previous shield design made for George IV to be a little more detailed. Interestingly, William was the only monarch not to use Pistrucci’s St George on the gold Sovereign at any time during his reign. Jean Baptiste Merlen’s work for the Royal Mint continued when Queen Victoria was coronated, with an updated version of the shield once more. The Royal Arms are a lot clearer on this image, the crown is smaller, and a wreath now flanks the shield. For our full range of Queen Victoria shield back Sovereigns, click here. After 46 years of the Royal Coat of Arms, the gold Sovereign returned to Pistrucci’s remodelled design of St George and the Dragon, which appeared on Sovereigns henceforth and still do to this day. the Royal Mint asked Bernard Sindall to create a special edition coin for their collection. The design heavily features the double Tudor rose as well as a crowned shield of the Royal Coat of Arms. The aim was to mimic the style of hammered Sovereigns made during Henry’s reign. Another commemorative coin, this Sovereign was produced by the Royal Mint to honour Queen Elizabeth II’s Golden Jubilee. 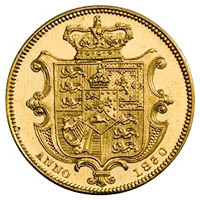 The coin was designed by Timothy Noad and is a throwback to the shield reverse used by Queen Victoria, with a modest crown sat upon the Coat of Arms and flanked by a wreath. dragon. St George is also brandishing a shield with a cross on it. Much like in 2002, the Diamond Jubilee Sovereign was commemorative in honour of 60 years of the Queen’s reign. British sculptor Paul Day won the Royal Mint’s competition to have his design minted. The Sovereign’s reverse features a more aggressive and unsightly dragon roaring at the lion, while St George lances the beast in the back. 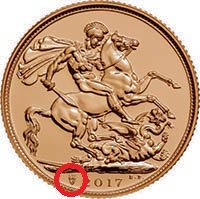 In 2017, the Royal Mint marked 200 years of what we deem the modern gold Sovereign coin by adding a small shield emblem with the number 200 above it to the left of the year date, seen on the image here in a red circle. Demand for this coin is high due to its anniversary status. Please be aware that the Royal Mint are no longer producing this coin. . Throughout the years, the Royal Mint has produced its gold Sovereigns at a variety of refineries across the world, as part of the British Empire and the Commonwealth. Most of these coins were minted in London and now Llantrisant, which are unmarked, but those minted away from the UK bear distinguishing marks to flag up their origin. These distinguishing marks can be found primarily above the year of mintage as a small letter, or in some older cases they can be found near the bottom of the coin in different places – beneath a neck, wreath or shield typically. For more detailed information about Sovereign mint marks, click here. Below are all the different monarchs whose portraits featured on what we know as the modern-day gold Sovereign coins, as well as different variations in the coin reverses. To view our range of gold Sovereigns by year, click here. 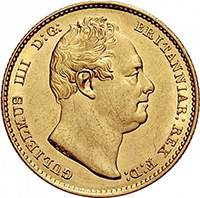 Gold Sovereigns were first introduced in 1817, towards the end of King George III’s reign. There was only one design – a right-facing portrait of the King on the front, and the thick-rimmed St George and the Dragon design on the back. The coin bears the latin ’HONI SOIT QUI MAL Y PENSE’, which translates as “Evil unto him who thinks evil of it”. 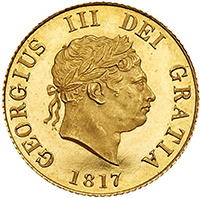 The George IV gold Sovereign coins ditched the thicker border in favour of larger portraits of both the King himself on the obverse, and St George on the reverse. George’s portrait is facing to the left, to differ from his predecessor, and Pistrucci’s St George was updated to now wield a sword. Like George IV before him, King William had two gold Sovereigns produced during his reign. These were only fractionally different, sporting two different busts of the King. The one has a more furrowed expression and greater detail to the King’s hair, while the other portrays the King as more peaceful. An unknown number of proof Sovereigns were commissioned for minting in 1830, but it’s not known how few of these were made. The coin is incredibly rare, and only a couple have ever been auctioned. 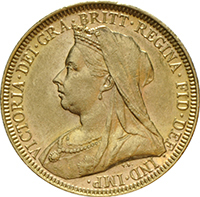 Queen Victoria was the first monarch to have more than two design variations of gold Sovereigns during her reign, reaching a grand total of four. 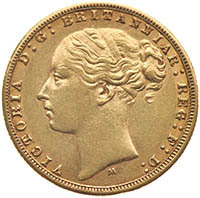 The youngest of the three portraits, this gold Sovereign featured Queen Victoria on the obverse and an updated version of Merlen’s Royal Arms shield on the reverse. Production was chiefly in London, though later versions were also made in Sydney and in Melbourne. Production of this coin ended before the Perth mint opened. No coins were made outside of London until 1871. 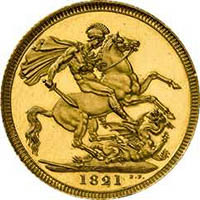 In 1871 the Royal Mint changed from using the shield on the gold Sovereigns and back to the classic St George and the Dragon reverse design. 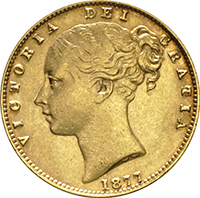 Like the other young head gold coin, production took place in London, Melbourne and Sydney. Following Queen Victoria’s Golden Jubilee in 1887, the Royal Mint ceased production of gold Sovereigns using her young portrait, instead updating the coins to use an image that closer reflected the monarch’s true age. The jubilee portrait is one of the most recognisable images of Queen Victoria and was designed by medallist and sculptor Joseph Edgar Boehm. The final portrait of Queen Victoria is dubbed the ‘Old Head’. The image, designed by Thomas Brock, shows a more mature Queen and reflected her position as a grandmother and – at the time – the longest serving monarch in British history. 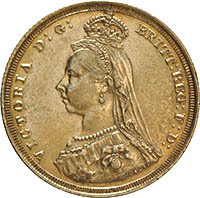 Victoria is at a slightly different angle compared to typical coin profiles. She is wearing a tiara, perhaps that designed by Prince Albert, her late husband, and has a widow’s veil – a style of dress she pursued after Albert’s passing and until her own death. 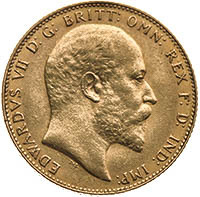 Only one design of gold Sovereign was produced by the Royal Mint for King Edward VII. This coin was the classic side portrait bust of the King, with texture detail marking his hair, beard, and moustache. The inscription around the Sovereign reads EDWARDVS VII D: G: BRITT: OMN: REX F: D: IND: IMP. A matte edition proof Sovereign of Edward VII was made in 1902 as part of specimen sets. 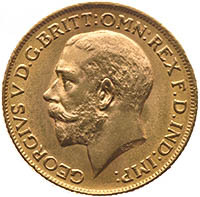 Production of gold Sovereigns during the reign of King George V was mixed due to the First World War and the prospect of the second by the end of his reign. 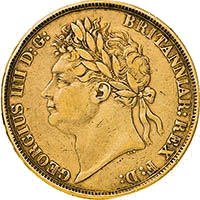 Gold Sovereigns were produced in London, Sydney, Melbourne, Perth, Ottawa, Bombay, and Pretoria as the British Empire peaked in terms of global reach. 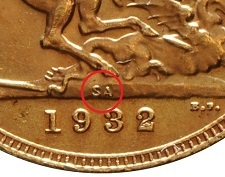 1911-1922 & 1933-1936 (South Africa). Sovereigns in Bombay, India were only produced in 1918. 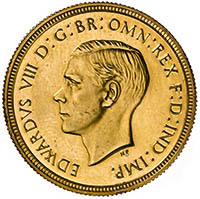 Only TWO sovereigns were made during Edward VIII’s brief reign. These were both proof coins, and intended as forerunners to the bullion Sovereign production due to start on January 1st 1937. The two coins both state 1937 as the year of their production, despite being made in 1936. Edward also broke tradition by facing the same way as his father, George V, for his portrait. This, he said, was to use his "good side"
for the coin depictions, and captured his classic side parting hairstyle. One of the coins sold at auction in 2014 for £516,000 - a record for a British coin. released to mark George's coronation. The only other Gold Sovereigns handled by the Royal Mint during George's reign were restrikes of 1925 Sovereigns. 886,000 of these coins - previously believed to be scarce - were restruck between 1949 and 1952. 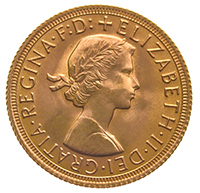 For the first few years of Queen Elizabeth’s reign, the Royal Mint did not produce any gold Sovereigns – continuing its halted production post-war. Demand from the Middle East and other nations that still used gold Sovereigns forced the Mint’s hand and, in 1957, production restarted in London, before migrating to Wales in the mid-1970s. 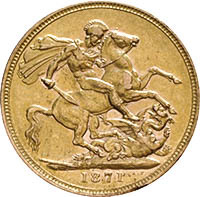 All gold Sovereigns bearing Elizabeth’s head on the obverse feature Pistrucci’s St George and the Dragon on the reverse unless a commemorative edition. Mary Gillick, but the design never made it onto a gold Sovereign until their recommission in 1957. In this portrait, the young Queen is wearing the Laureate crown or the Laurel wreath. The latin accompanying the Queen’s portrait is DEI GRATIA REGINA F.D., which translates as ‘By the Grace of God, Queen’ and ‘Defender of the Faith’. other, later Sovereigns. Production was in London. the full range of Royal Mint coins in 1970-71 with decimalisation. Arnold Machin, the sculptor and coin specialist, was chosen to design the second portrait of Queen Elizabeth. appears as on the first Sovereign. Production was mostly in London, before the Royal Mint moved to a larger facility in South Wales during the 1970s. 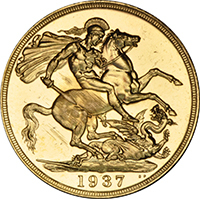 To view the 1989 special edition Sovereign reverse, click here. 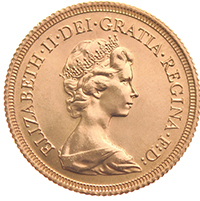 Gold Sovereigns between 1985 and 1997 were issued by the Royal Mint in proof finish only. This format is complete with box and Certificate of Authentication but meant an additional premium for buyers compared to the bullion coins. The design of the middle-aged Queen was by Raphael Maklouf and sees the monarch wearing the King George IV State Diadem (worn during the annual State Opening of Parliament) and Diamond Jubilee drop pearl earrings. 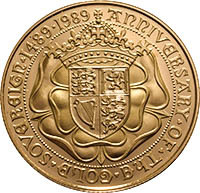 As mentioned earlier on this page, there was a 1989 special edition Gold Sovereign issued, marking 500 years since the first ever Sovereign was produced by the Royal Mint. This coin bears the Tudor rose on the reverse and Queen Elizabeth on the obverse. The fourth portrait of Queen Elizabeth is probably the most recognised of all images of the Queen. 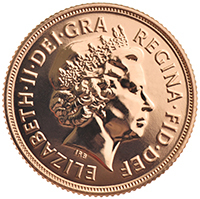 Designed by Ian Rank-Broadley, the coin sports a more mature monarch and reflects her status as a grandmother, as well as a long-reigning royal. The portrait is also slightly larger than previous iterations – a deliberate move by the artist as a nod to her significance in British culture. 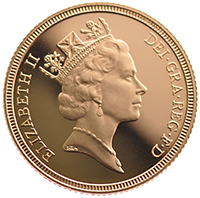 The coins were only available in proof finish until 2000 and, at the change of the millennium, the Royal Mint resumed production of uncirculated bullion gold Sovereigns. To view the 2002 special edition Sovereign reverse, click here. To view the 2005 special edition Sovereign reverse, click here. 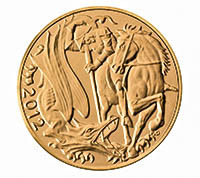 To view the 2012 special edition Sovereign reverse, click here. 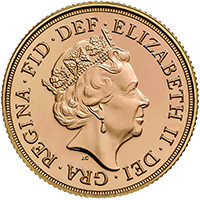 The fifth and likely final portrait sovereign design of Queen Elizabeth II was debuted in 2015, having been designed by the Royal Mint’s own engraver Jody Clark. This is the first time the Mint has had one of its own employees design a sovereign portrait for a monarch. Like the fourth portrait borrowed elements from the decimal head, the fifth portrait borrows from the third; the King George IV State Diadem and Diamond Jubilee drop pearl earrings make a return in Clark’s design. The milled edge and lettering are very crisp to look at, showing the progress in modern minting technology. For our full range of Gold Sovereigns please click here.